This project, undertaken as part of my Master in Architecture (History and Theory), was comprised of a series of workshops, seminars and independent exercises, intended to loosely frame the rich potential of architectural research practices at a post-graduate level. Practices, which would not be considered “objective” or rigorous enough within conventional spheres of academia but within architecture (and the humanities in general) are representative of a post-modern perspectivism that recognises and values the inherently subjective nature of the world and the knowledge generated within it. Through an intensive six week program, the potential of many unorthodox research practices were explored through three independent, yet fundamentally interconnected, foci. The first, ‘Making’, looked at possibilities of depictive forms of representation; the second, ‘Mapping’, looked at the potential of modern cartographic practices; and the third, ‘Writing’, explored the dynamic nature of language, as both a source of research and as a means of communicating it. From the ‘Making’ series, I became critically aware of the nuanced qualities of certain representative practices and their unique potential for architectural research. Practices such as sketching, while offering little in terms of “objective” knowledge, can, within architecture, come to relay important characteristics of space and form that are otherwise difficult to capture. 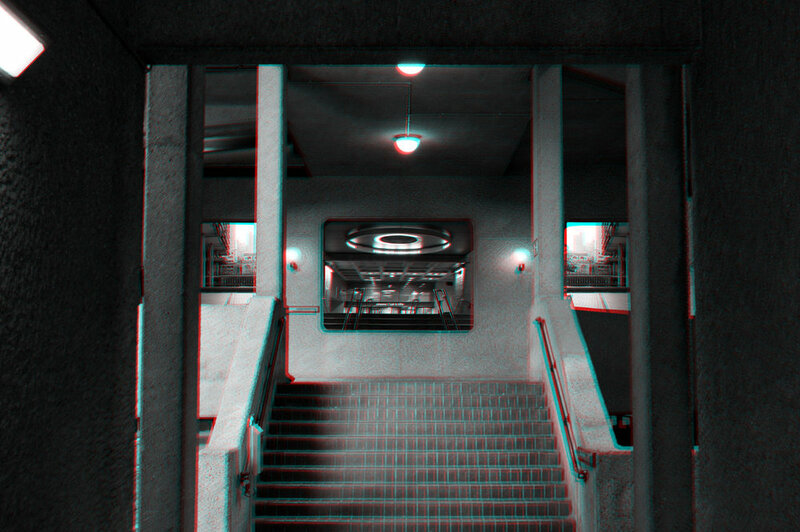 As an exercise, we were asked to explore the concept of “layering” at the Barbican Centre in London, using stereoscopic imagery. In response, I formulated two distinct interpretations of this notion: the first, based on the modernist concept of “layered space” and the second, based on my own interest in compounding (or “layering”) information. 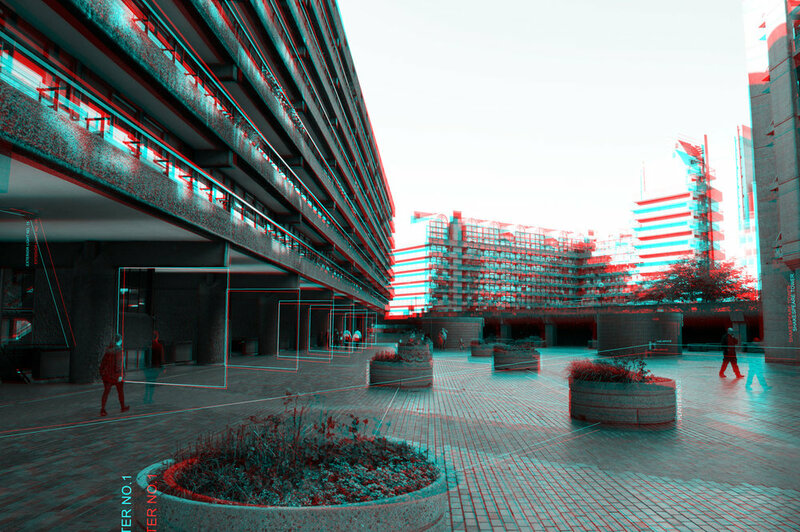 The first interpretation sought to capture elements of the Barbican Centre that best illustrated "layered space" through stereoscopic imagery. Whereas, the second interpretation sought to challenge existing views of the Barbican Centre by recreating it through stereoscopic montage compositions. To me, these methods (particularly the latter) demonstrated how unorthodox means of perception can reveal new understandings of an object, otherwise unobservable through more generalised perspectives. From the ‘Mapping’ series, I came to appreciate that, from a post-modern perspective, the history and present day usage of cartography, was far from as innocent or “objective” as it seemed. By depicting only certain Cartesian elements of space, it was just as guilty as any other form of representation in emphasising one reality of the world over another. With that said, the operative value of cartography – the static depiction of complex elements in space – was seen as having a substantial potential for post-modern architectural research. As an exercise, we were asked to explore this potential by charting our own ‘personal geographies’, in whichever way we understood them. My response, entitled ‘London: A Milieu of Thought’, fused together my mental and physical landscape, thereby demonstrating the interconnectivity between space and other less tangible qualities of life, such as memories, ideas or emotions; factors, which are crucial to architectural knowledge, yet typically neglected without the necessary means of capturing and communicating them. From the ‘Writing’ series, I came to better understand the complex spectrum of language and the practically limitless opportunities it affords to architectural research. Following a critical review of many eclectic writings on and around architecture, we were asked to conduct a review of the 2014 Serpentine Pavilion. My response, entitled ‘One Hour Over Coffee: Smiljan Radic’s Serpentine Pavilion’, focused specifically on the nature of its “interaction”; an engendering quality of architecture that I felt was often left out in favour of more “objective” and comprehensive building reviews. Through this focus, I wanted to not only convey the interactions of its users but also my own engagement, relative to these. By rendering my role and position in space, I wanted to give some sense of perspective to my observations and, with that, a layer of criticality with which to considered their value. This focus and the way I communicated it, started what was a long preoccupation with the experience of architecture and the way in which we represent it. Influencing, foremost, an essay on “narrative" writing in architectural criticism and my Master’s thesis on the representation of architecture, as perceived through a state of "distraction".